So many films missed the cut off date, for example A Bug’s Life (1998), Tarzan (1999), The Iron Giant (1999) and Toy Story 2 (1999). Good year for kids films, but I am unwilling to change the almighty rules of the top ten. For I have spoken my gibberish! Part 2 actually got the most comments of any of my posts; previous was my Avengers 2012 review. On to the Results of these powerhouse kids films, dun dun dun dun! The Incredibles revolves around former high-profile superhero Bob Parr (aka Mr. Incredible), who has not-so-successfully settled into suburban life along with his wife and kids under the watchful eye of the Superhero Protection Program. A far cry from the “glory days” during which “supers” were a welcome addition to society, the Parrs’ living situation was brought on after a series of superhero-related lawsuits forced them into hiding. When not trying to fight small-time crime undercover with fellow former superhero Frozone (Samuel L. Jackson), Parr (voice by Craig T. Nelson) is muddling through the corporate world as a paunchy, emotionally unsatisfied insurance claims adjuster. His family is like any other with some notable exceptions — his daughter has the uncanny ability to become invisible and create impenetrable force fields at will; his son, Dash, can run at incredible speeds; his wife, Helen (Holly Hunter), is known in super circles as Elastigirl, one of the most respected (and pliable) superwomen of her time. This film was designed to be for the entire family to watch and enjoy, they did that perfectly. With the dad who is in practically the same situation a lot dads are with a dead end job, then the stay at home mum who used to do so much more, and finally the kids who wish that they could do more but are controlled by their parents and then they rubbed some super powers into that classic family which creates this masterpiece. My favourite scene would probably be the final battle at the end but to be honest I loved every scene in this film, the beginning where you see the old days of supers ad then how that ended is so believable when you think about the real world with people suing and prosecuting to make a quick buck. That’s something that has been picked up on in a few comics as too the fall of superheroes and I am glad that they did that because it made the film. 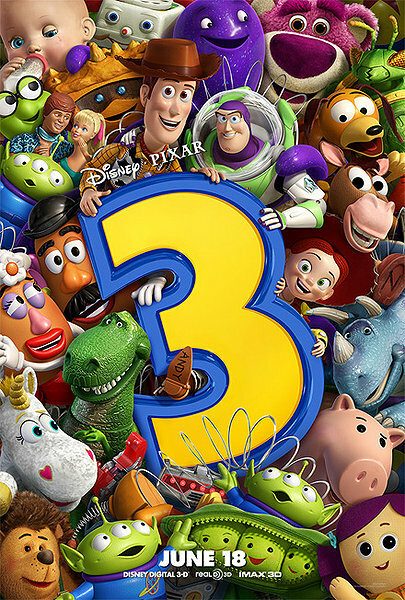 Pixar returns to their first success with Toy Story 3. The movie begins with Andy leaving for college and donating his beloved toys — including Woody (Tom Hanks) and Buzz (Tim Allen) – to a daycare. While the crew meets new friends, including Ken (Michael Keaton), they soon grow to hate their new surroundings and plan an escape. The film was directed by Lee Unkrich from a script co-authored by Little Miss Sunshine scribe Michael Arndt. Woody, Buzz and the whole gang are back. As their owner Andy prepares to depart for college, his loyal toys find themselves in daycare where untamed tots with their sticky little fingers do not play nice. So, it’s all for one and one for all as they join Barbie’s counterpart Ken, a thespian hedgehog named Mr. Pricklepants and a pink, strawberry-scented teddy bear called Lots-o’-Huggin’ Bear to plan their great escape. Tim’s Film Reviews Recommended. This film really takes you back to your child hood and so very close to the original film in terms of feel and quality. I think the film draws on the audience all seeing the original film and already knowing the characters perfectly, that’s clever and works because we do know them and every kid has been made to watch the original film anyway. A lot of films make the mistake of going back and explaining the something like we are idiots and I am glad that Pixar know better. I think some of the best parts where from some of the newer toys especially ken and the triceratops which did great parts. My favourite part would have to be the part that made me laugh the most which was the ken and Barbie scene that genuinely put me in tears of laughter because that is what I would expect them to be if they could talk and it was just really funny. This seems like two fair winners! Toy Story 3 reminded every one of their childhood – it surely did it for me. What would u vote for? I’m going to have to say that I didn’t actually like Wall-e. But I can see the appeal for others. Saying that, I completely agree with the winners – Toy Story 3 and The Incredibles were both fantastic… so good I’m going to have to dig the Incredibles out and watch it again now! I like How to Train as well, but its no where near in the pantheon of Pixar’s best, like WallE and Up. Which did you vote for?